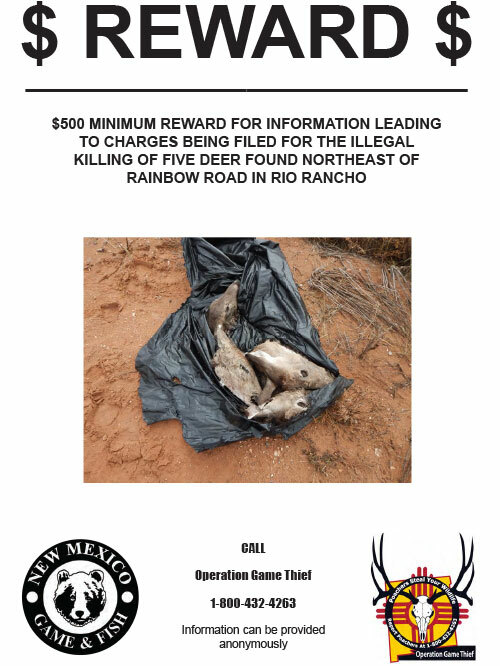 Operation Game Thief is a New Mexico Department of Game and Fish program, which pays rewards to citizens who turn in poachers. 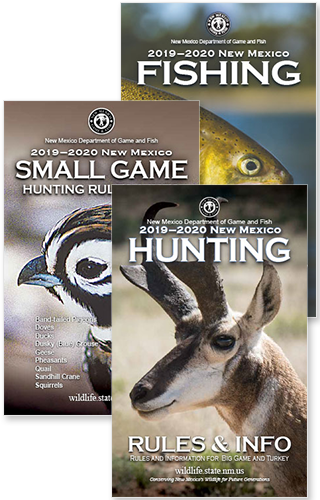 Begun in 1977 here in New Mexico, Operation Game Thief or a similar program has now been adopted by nearly every other state. In short, Operation Game Thief is crime-stoppers for wildlife. In fact, the program was modeled after the original crime-stoppers program started by the Albuquerque, NM Police Department. $250 for turkey, bear, cougar, javelina, ibex, barbary sheep, endangered species, small game, fish, raptors and furbearers. Report poaching in another state. Why Develop Such A Program? In the 1970’s, most game and fish departments were still working under the misconception that poachers were not really criminals. Most of the public at that time still excused the game violator by continuing to believe that they only poached to “feed their family” or that the level of illegally killed game animals was insignificant. With this in mind, in 1975 the Department initiated a unique study to determine just how significant poaching was here in New Mexico. A young man was hired to cover the state and give the appearance of violating New Mexico’s big game laws. He salvaged heads, hides and feet from hunting season discards and from road kills, then froze them to plant later as “evidence” of violations. Under a collector’s permit, he actually killed a few animals and put them to similar use. All his operations were conducted with the knowledge of only a very small number of people. Hardly anyone in the department knew of his existence, even fewer knew of his purpose. Armed with a large collection of deer parts, he then went about his task of placing simulations of poaching evidence throughout the state. The obvious intent was to determine how many of the simulated poaching events were reported to the department, even when the operative knew that the public had observed him. At the conclusion of the research project, it was clear that the significance of the out-of-season deer kills was very serious, and was estimated in the neighborhood of 34,000 deer per year. Similar studies in other states produce comparable results and indicated that there were as many deer being killed illegally as there were being taken lawfully. While some of the simulations were observed, there were not as many detected or reported to the department as we would have liked. The operative attributed his success in avoiding apprehension to two primary things. The officers districts were too big, and they aren’t getting any help from the public. The Operation Game Thief system is set up to accept calls 24 hours a day, 7 days a week, to make sure that we are available whenever someone has information about a wildlife law violation. If you are uncertain about whether or not the information should be reported, the best thing to do is make the report and let a Game and Fish officer sort out the problem. All calls are confidential and the reporting individual has the option of remaining anonymous. Most wildlife enthusiasts don’t except the reward — they just want the criminals stopped! The key to success and catching poachers is to report the information as quickly as possible. It is also helpful to give as much detailed information as possible. The following is a checklist which is helpful in providing the necessary information. It’s easy to donate and support New Mexico’s wildlife! Operation Game Thief needs your support for continuing success. Your donation is tax deductible, and the money is used to pay rewards in wildlife cases and to promote the OGT program. Annually the Operation Game Thief program pays between $8,000 – $10,000 in rewards, and its conviction rate exceeds 98%. Most cases involve big game, such as deer, elk, antelope, bear, cougar and turkey, but callers have also tripped up poachers taking overlimits of fish and game birds, killing raptors and illegally collecting endangered species. The reward fund doesn’t use tax or license dollars. It comes from clubs, organizations, businesses and mainly, thousands of ordinary men and women who have chipped in from a few dollars to several hundred, showing their support for Operation Game Thief — and sending the poacher a message.